The Apple iPad announcement was not just a big day for Apple, it was a huge day for the gadget blogs. Chartbeat is under the hood of a number of the largest gadget blogs including gizmodo, gdgt and techland and every site saw exploding traffic. 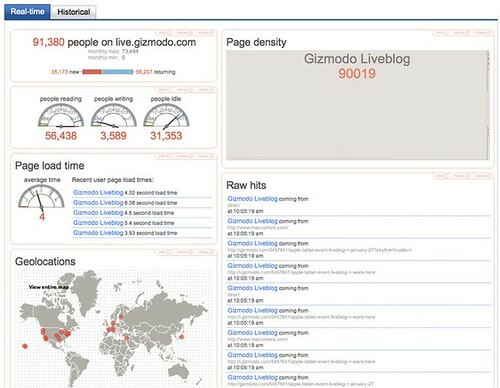 Gizmodo saw an incredible 110,000 people simultaneously on their live blog alone with tens of thousands more on the site itself. It’s in these increasingly common peaks and troughs of the social web that real-time analytics can really help site owners to exploit the opportunity. Gdgt founder Peter Rojas noted that: ‘During yesterday’s Apple event we used Chartbeat to track how people were moving between the live blog and the rest of the site. It was amazing — and incredibly useful — to be able to see the surge of users and how they moved around the in real-time.’ Gdgt was able to adapt its site to the flows of traffic as they happened in real-time to maximize the opportunity that presented itself. For Gawkermedia CTO Thomas Plunkett, there was an additional benefit: ‘By providing key information in real-time, we have a much more precise understanding of the traffic we must support as we add features to our next generation liveblog platform.’ Gawkermedia’s ability to track exactly what was happening on their site, down to how long the page took to load on each visitors browser, when traffic took off and then use Chartbeat’s tivo-like functions to replay afterwards what happened, meant that they will be better prepared for the next spike. Trying to deal with these kind of events only using traditional analytics is a little like having a fire alarm on a 24-hour delay. It’s good to know that your house was on fire yesterday, but it’s a little late to be able to do anything about it. It’s real-time analytics tools like chartbeat that give you the tools to take advantage and make the most of these kinds of spikes.